This Gluten Free Indian dish of Chicken and Basmati Rice is an easier version of a biryani, yet elegant in itself to be served to company. What do you do when you have enough leftovers for just one person and there is some chicken in the refrigerator? You make some quick chicken pulao for the two meat eaters in the family and enjoy the leftovers for yourself. That was one day last week in our household. I try and buy some chicken breast or chicken breast tenders and keep, as you never know when that will come in handy. I go grocery shopping at least three times a week, if not more , because I like to buy my vegetables and other produce fresh, especially when it is not so inconvenient for me to go that often. So just a one pound pack of chicken is all I buy and keep for just in case days. This is a very quick and simple recipe to make for a weeknight dinner. Even a newbie in Indian cooking can easily fix this meal! Wash the basmati rice and cook it in the 3 cups of water, till all the water has evaporated. Fluff with a fork and keep aside. Roughly powder the spices – cloves, cardamom, cinnamon and star anise with a mortar and pestle. Heat the oil in a deep heavy bottomed pan and add the powdered spices and bay leaf to it. Once they become fragrant, add the onion, ginger and garlic to it. Sauté till the onion softens. Add the turmeric and cayenne and the chicken tenders. Cook covered on medium heat till the chicken is cooked through. Add the salt. Slowly stir in the cooked rice and mix very lightly. You don’t want the rice to break and become all mushy. Garnish with cilantro and serve with yogurt or raita and pickle! This looks absolutely delicious and I LOVE that it’s gluten free!!! Lots of nice flavors in this recipe! I’m always looking for recipes for leftover chicken. This looks like a terrific way to serve chicken! Manju…I can do this. This recipe is right up my alley and I know my boys will love it. I don’t get my fill of Indian cooking as much as I would like to (usually it’s next door to the neighbors for dinner) so this recipe is one I will try and share with all the ladies on the street. We are all big fans of this cuisine. Yum! My mom eats gluten free and this looks delicious! I’ll have to make it next time my parents are over for dinner! Thanks Rebecca! Im sure they will love it! This looks delicious and you make it sound so easy! I will have to try it soon! Looks wonderful and gluten free. That is a double win. What a great meal to have in your “recipe box” for nights when you’d like something filling and easy to cook. The seasoning blend sounds fantastic. Thank you Lydia! It is my go to seasoning blend! This looks great. Leftovers in a new way is always good. Yum! Such lovely spices in this dish! 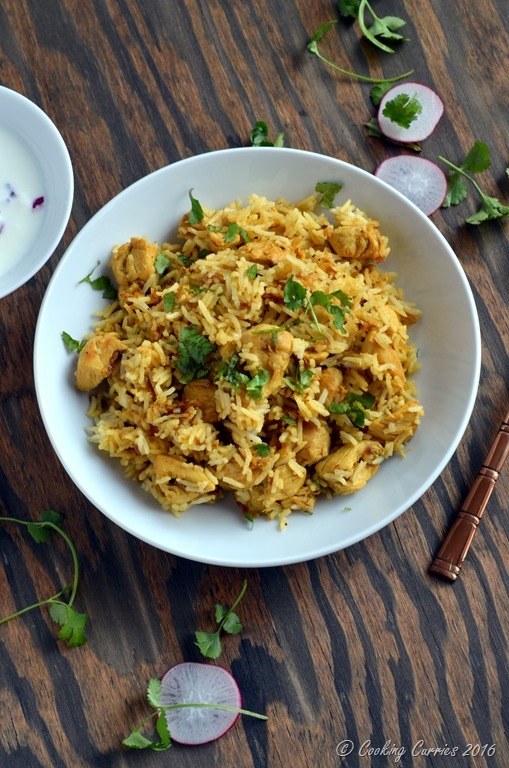 Chicken pulao is most favorite South East Asian dish! 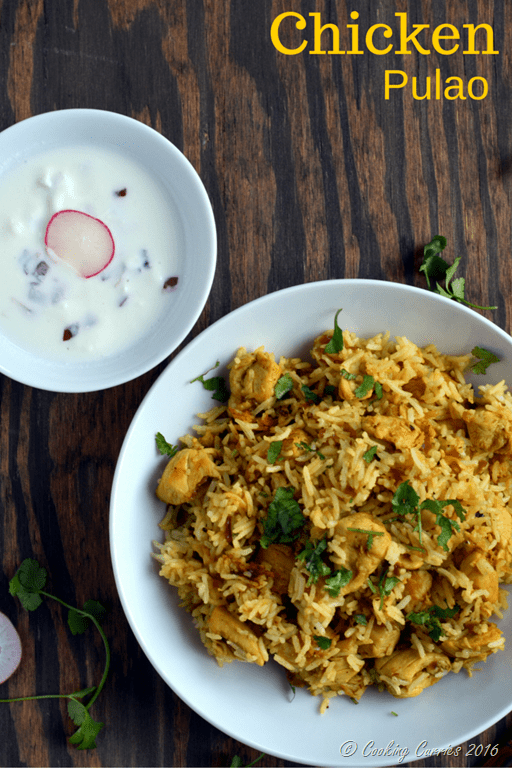 Pulao and some raita, and a side of cucumber salad. yes please! This Chicken Pulao is so good. Saving this recipe for the weekend. Loved the pictures too. This looks mouthwatering. 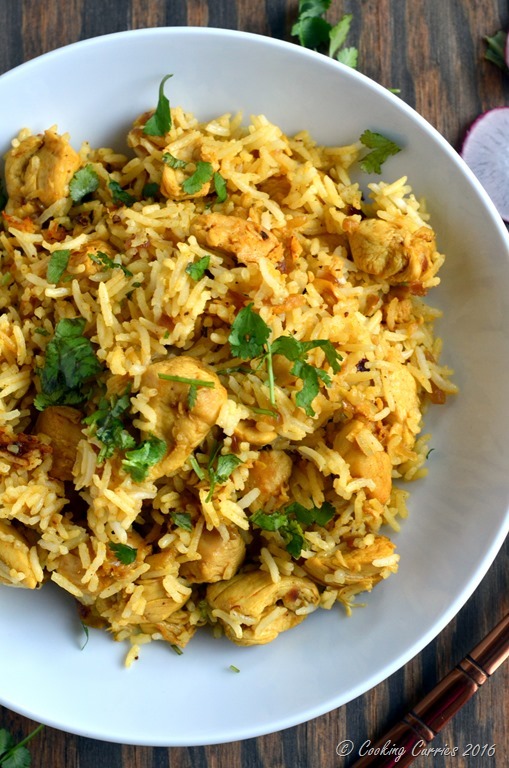 I love chicken biriyani, so I bet pulao is amazing too! This look so delicious, I just wanna grab that plate and start eating! 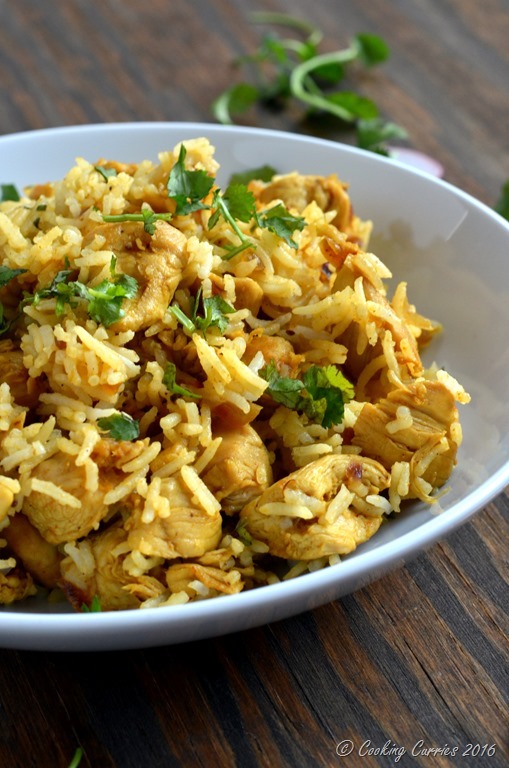 Love Chicken Pulao and the recipe looks great! This looks droolicious!!! can’t take my eyes off!! This was very good! Even my picky family that claims they hate Indian food jumped on board with this one. The only thing I did differently was use about 2.5 cups of water instead of 3. Generally the more rice you use the less water you need because only about 3/4 of a cup of water evaporates no mater how large the pot of rice. I used an estimate based on the ratios from my bag of basmati. It was almost too soggy even with that ratio. I think I’d also use slightly less cinnamon although maybe my estimate on length was a little munch. The cinnamon flavor was a bit strong but not too bad. This was so good that we weren’t left with any left overs for lunch the next day and I’m making it a second time only two weeks later. Thank you!